George Graham Reviews Josienne Clarke and Ben Walker's "Overnight"
The English folk scene, as personified by groups like Fairport Convention, Steeleye Span and the Pentangle had its ascendancy in the late 1960s and early Seventies. While the style was more popular in the UK than on this side of the Atlantic, the genre has maintained a kind of cult following here. The style’s best-known performers, such as Richard Thompson, Sandy Denny and Nick Drake have proven to have had a lasting influence on other artists. Not surprisingly, the style has lingered on the music scene in various dark little corners away from the bright lights of the commercial pop music industry. Some of the surviving original artists continue to make music, while periodically performers emerge from both sides of the Atlantic carrying on the influence with varying degrees of new twists. In the past couple of years, we have had worthwhile recordings by the bands Snowgoose and the Staves, as well as singer-songwriters like John Doyle from Ireland, Sarah McQuaid and Kate Rusby from the UK, and Ryley Walker and Victoria Blythe from the USA. This week we have another worthwhile album from a duo who draw on the English folk scene for their principal influence, especially in terms of the female vocal approach. They are Josienne Clarke and Ben Walker, and their CD release, their first full-length album to be issued in the US, is called Overnight. Josienne Clarke grew up in a musical family in Sussex. Her father was a folksinger himself. Ms. Clarke studied classical voice and sang with choirs, but was not surprisingly attracted to folk and rock. Ben Walker studied classical guitar before playing in a number of rock bands, then getting back to acoustic guitar and unabashedly drawing on the influence of some of the English folk pickers like Richard Thompson, Bert Jansch and Martin Simpson. So with influences like that, the osmosis of the English folk-scene was more or less inevitable, with some classical influence also present. By 2012 the London-based duo was achieving some prominence. Ms. Clarke won a BBC Folk award in 2012, and the duo won a similar award in 2015. Overnight in their sixth release, including some EPs. The new album features mainly original material, but they also cover some unexpected pieces, including one by Gillian Welch and David Rawlings, and one by the 16th Century English composer John Dowland. Ben Walker is the principal instrumentalist on various guitars and keyboards, with Ms. Clarke concentrating on the vocals, but interestingly, she plays the saxophone on one piece. The mostly acoustic instrumentation includes a small string ensemble and some classical brass instruments. Walker does the arrangements, which turn out to be especially worthwhile and a nice setting for Ms. Clarke’s sometimes plaintive vocals. The publicity included with the album indicates that most of it was recorded live in the studio with minimal overdubbing, which I think helps to underscore its organic and authentic sound. A close listen can pick out a few little flaws here and there, but it gives the album charm as well as musical honesty, of which there is not much on today’s computer-generated pop scene. Stylistically, the group tries different things, including going retro-electric on one track, with a kind of classical quality on several others. The album has a kind of lyrical theme which runs through it, based on its title Overnight. Though the songs are independent of one another, most make reference to parts of the day. Ms. Clarke is the main songwriter, though she and Walker share songwriting credits on two of the non-cover compositions. For a long-time fan like myself, it’s nice to see that the English folk influence continues in the hands of younger artists, almost 50 years after the genre’s appearance in the late 1960s. 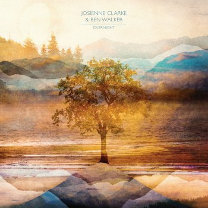 While Josienne Clarke and Ben Walker’s new album Overnight, may not be an authentic recreation of the original style, it’s nice that the duo has absorbed the influences of the scene, and applied their own creativity to it with very nice results. Ms. Clarke’s vocal style shows some of the same timeless qualities of the great women vocalists who came out of the scene like Sandy Denny, June Tabor and Linda Thompson. Ben Walker’s arrangements are first rate, and at the string scores can at times bear a resemblance to those on the late Nick Drake’s records. All in all, Overnight is an outstanding album that borrows from the classic and adds new ingredients. Josienne Clarke and Ben Walker have been attracting a fair amount of attention in the UK for their English folk-influenced music. It’s nice that their new album is now being distributed in the US, helping to keep us fans of the genre happy.